Fill a baking pan with hot water and place the uncooked noodles into the water. Set aside. Make sure the noodles are separated. In large skillet, combine Italian sausage, ground beef, onion, and garlic. Cook until meat is no longer pink and onion is tender; drain. Stir in next 7 ingredients. Bring to boil. Reduce heat; simmer 20 minutes. In medium bowl, blend ricotta, egg, parsley, and salt. Spoon 1 1/2 cups of meat sauce into 13 x 9 inch baking dish. 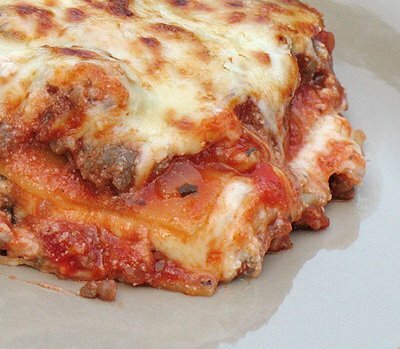 Layer one-third each lasagna, remaining meat sauce, ricotta mixture, olives, mozzarella cheese, and Parmesan cheese. Repeat layers. Cover. Bake in 375 degree F oven for 25 minutes. Uncover, bake until hot, about 20 minutes longer. Let stand 10 minutes before cutting.